In 1981, Saturday Night Live featured MC Sha Rock – the first female rapper to appear on national broadcast TV. In 1984, 14-year-old rapper Roxanne Shante recorded the first battle response in hip hop history. By 1988, MC Lyte was the first solo female rapper to release her own full-length album, Lyte As A Rock. “It destroys (hip hop) culture not to have the perspective of women,” Lyte once remarked after asking for the reinstatement of a female-specific awards category at the Grammys. Lyte’s words permeate the entire history of the genre, from her early days rapping about growing up as a girl in Brooklyn, to Missy Elliott’s recent induction as the first female rapper into the Songwriters Hall of Fame. Women added a new dimension to hip hop culture, with their ruthless approach to sexual liberation, body positivity, and equality which counterbalanced the genre’s misogyny. Today, their influence lives on in the fact that we are still so enamoured by the early women of hip hop, from the distinct spiritual essence of Erykah Badu and Lauryn Hill, to the persistent feminist legacy of Missy and Lil Kim. Other key Johnson shoots include Queen Latifah in 1990s New Jersey, and intimate images of Badu. In addition, Johnson was once a regular Dazed print contributor, like this iconic shot of Andre 3000 which he shot in 2002. Now Johnson photographs younger artists, those who have expelled the gender boundaries of music altogether, from Juliana Huxtable, to Le1f, to Honey Dijon. Eric Johnson: Queen Latifah was my first shoot. 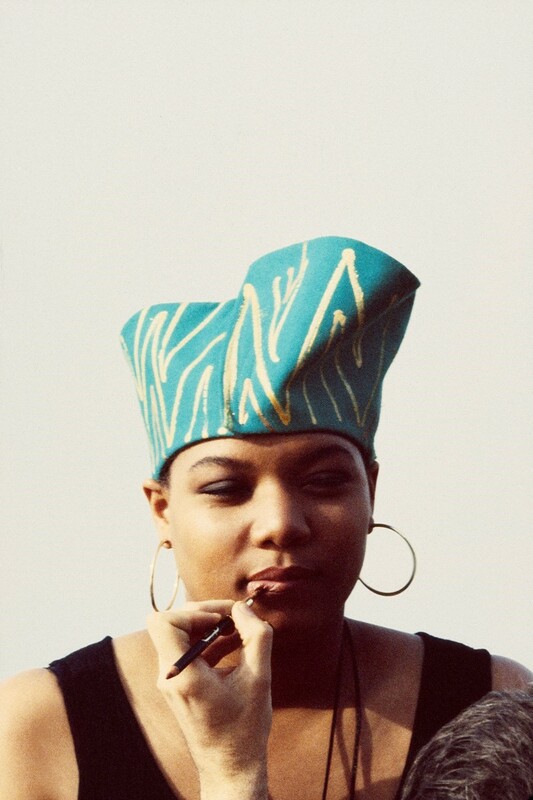 She came out in 87 or 88, so by 1990, she was just starting to change from the type of rapper who was in DJ Red Alert and Marley Marl’s mix shows, to someone that was becoming more broad. I feel like at that point, she was on a remix for David Bowie. She was from Newark as well, so I remember meeting up with her downtown. She had her Jeep, I had my Jeep, we were all about riding around in our Jeeps back then, so I was just following her around to different locations that she was familiar with. We would get to a location hop out, take some photos, go to the next location, hop out. If you look at 1990, this was when Queen Latifah was starting to go beyond hip hop. Eric Johnson: When I was being considered for this shoot, we were all buzzing, because everybody knew Lauryn Hill was going to be the thing. With The Fugees, there was such a great buzz, but Lauryn was the stand-out. Everyone wanted that project. When I told my mum I was being considered – who was in Newark, and by this point I was in Brooklyn – she was like, “Oh, I know Lauryn, I used to do her hair growing up”, because my mum had a beauty salon. She was like, “In fact, she still comes by every once in a while to say hello.” My mum lived on South Orange Avenue, so I can only imagine that Lauryn, after being super successful, would stop by and say hello to the women there. My mum and her mum came to the shoot. We all started the day off with our parents and then we jumped right into it. We were shooting at the high school she went to in New Jersey. She was really, really focused. We’d have meetings before the shoot where I’d go to her house and she’d order us Italian food and play music. She was all about her colour palette. She’d pull really great photos for an inspiration board. One I remember in particular was Jane Fonda in Klute, it was just so advanced. It wasn’t like someone that had any kind of hip hop references, or someone who was at that level. It was someone who had had classic films and photo shoots from Italian Vogue that had great colour palettes. She was really advanced for her age and the culture of everyone I’d worked with so far. Eric Johnson: This was shot the year the song “Love is Blind” came out. Eve was the next female rapper underneath that group, after Oxy and Lil Kim. There was a really great buzz about her. She bought hood lyrics with a more cleaned up style. At that point she was very aware of being styled, she was rising at a time when they were trying to get rappers more fashion campaigns and things like that. 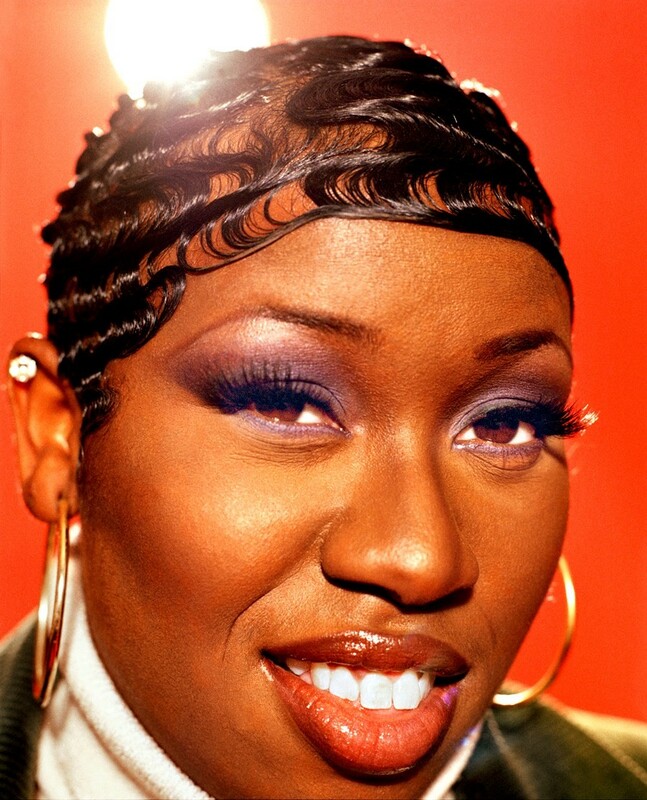 I felt like she was a lot more – the styling was a lot more than it had been for say Da Brat and Foxy Brown. It wasn’t quite as raw as those kids were, but she was pretty chill and professional. At this point, she was very ready to go to the next level so she played it cool. Because we were down on the Lower East Side, we went outside to shoot on the street and all of these kids in the hood surrounded us. That’s why the black and white image on the street shows all of these kids following her around, some on bikes. Eric Johnson: As soon as Missy came out, right out the gate, she meant business. When she came to the shoot she was asking me what I was up to, when I was telling her about some of the artists I was working with she was like tell them I wanna do something with them. She was the first one I noticed that was a little bit less about her as the artist and more about collaboration. You could just tell she wasn’t trying to hop on someone’s tracks, she was all business and was so confident. Which is interesting because I didn’t even put two and two together, but this buisness essense is why she’s now the first female rapper in the Songwriters Hall of Fame, because she had it from day one. Eric Johnson: Erykah was so regal, she just came out on the scene like a queen. We all just respected her. She was all candles and incense, and that was really cool because it was different from the way we were introduced to R&B and hip hop before her. She came up with this really authentic queen vibe. I remember I went to see her play once in London, at the beginning of her career, and immediately after the show people felt it was the real coming of something, they’d never seen anything like her. 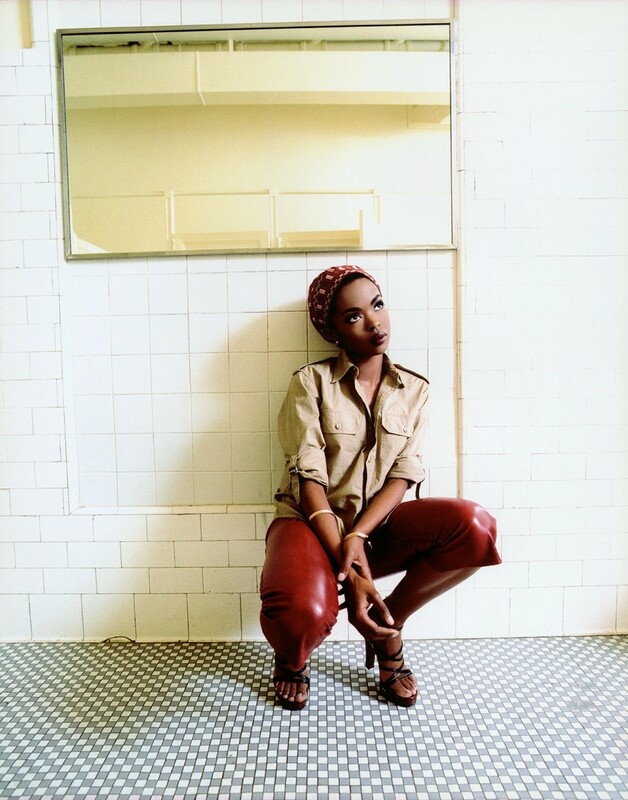 Which totally makes sense now seeing as we are still so intrigued with her, as we are with Lauryn Hill. There were more artists that were different from them than like them. They were really something back then and they’re still something now. Maxwell, D’Angelo, and Erykah and Lauryn, they were so few compared to everybody else but they still have a voice. I got to do the sickest ones. There was a photo of Erykah that I did later that she was really stripped down. One was the cover of The FADER and that was one of their most popular covers. At the time, there was this guy who I knew in jail and he said to me “listen, send me photos of celebrities and things like that, but not in the studio – send me photos as if Pink was hanging out in your living room”. It really clicked to me that someone in jail who is more like people in the hood and always knew what was first in a way was bored with fake retouched photos of people. That inspired me to shoot that picture of Erykah stripped down. A lot of people in the industry told me that that was the beginning of them seeing rappers in scenarios that were stripped down, no makeup, no styling or anything. It was a real shift in photography. Eric Johnson: Mary J Blige, to this day, I am still so afraid of. Something about her, she just gives off this air, like don’t play with her. That said, when she came in for this shoot, she was like, “You have such nice skin for a boy!” That was how we met, so I’ve been with her ever since (laughs). This was in one of the first couple of years of her career, before Total and those guys. Back then it was like really early, and what was really kind of fun was the days. You know you’d come into a shoot like that and it would be like 50 kids from the block. There was just something so fun about all of these young black people. Everybody good looking, playing music. It was like your manager was your cousin, it was just that vibe. Everyone involved just seemed like they were from the block. Eric Johnson: This is really a cute story and very telling of Aaliyah. I was talking to my friend Michael Bodi on the phone during our shoot. He is a hairstylist. He said to me, “I know Aaliyah, I’ve done her hair, let me speak to her.” And you would never say to a subject, “Oh would you speak to someone on the phone”, because when you don’t know if they really know each other or if she’s in the mood but for some reason, but when I told her Michael Bodi was on the line, she was like, “Give me that phone”. She took the phone and kikied and giggled with him like two schoolgirls. I thought that was so telling of when people say how down to earth she was. If they were shooting a video in the projects, she’d be out there with everybody. The fact that she was holding my phone talking to my friend giggling I was just like that’s why we all live for her. The night before this shoot I had stayed out really late partying with a friend from Berlin. I must have got there like three minutes late, but she was already there at Pier 59 studio, with her mum, her hair and makeup done. There was a mystique about her that even to this day you can see. When you look at photos of other musicians, they are a bit more raw. 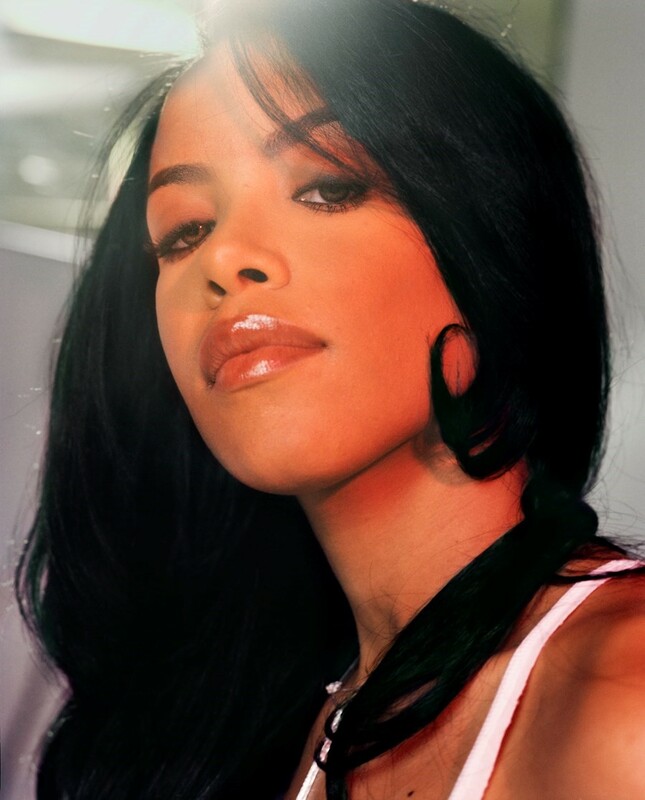 But for some reason, I think the photos of Aaliyah are more conventionally beautiful and are more beautiful than anything I’ve ever done, before or after. She inspired me to follow her lead more than anyone before. And the fact that after she passed, her images are still so ingrained in culture says a lot. I was left to tell part of the story through my photoshoot with her.